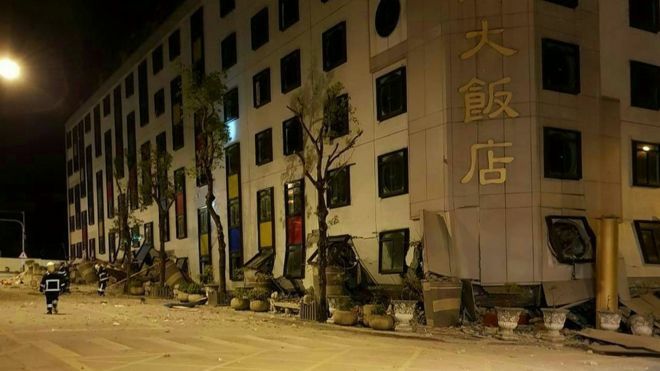 Just before midnight local time, a M=6.4 earthquake struck Eastern Taiwan, toppling buildings, collapsing ground floors, and buckling streets. The quake, which comes just two days after a M=6.1 approximately 20 km to the southeast, occurred at a depth of 10 km and registered very strong shaking in the city of Hualien according to the Taiwan Central Weather Bureau. Hualien is home to over 100,000 people. Yesterday, when we wrote about the M=6.1 over the weekend, we pointed out that its location marks the intersection of the Longitudinal Valley Fault and the Ryukyu Trench. Because of this, the area is prone to experiencing large magnitude earthquakes, meaning this quake should not be considered surprising. Further, earthquakes at fault junctions and tips are slightly more likely to trigger still larger shocks than others. 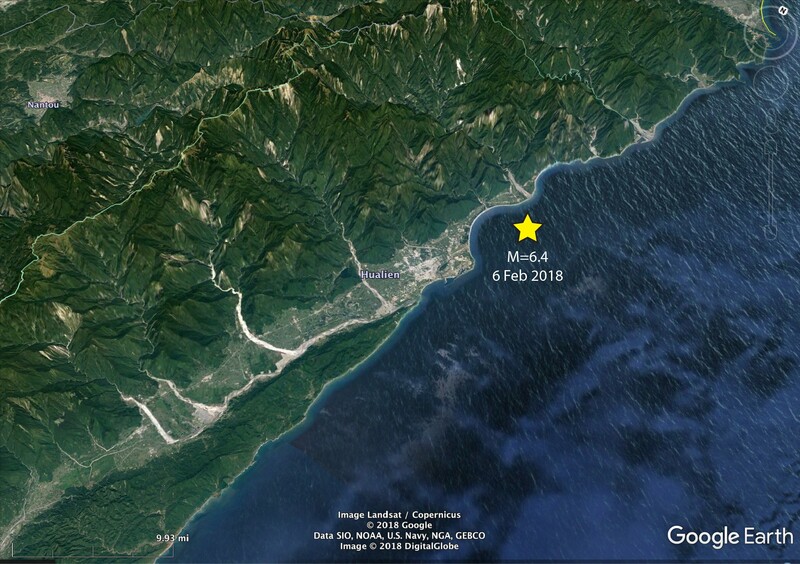 This Google Earth image shows the location of today’s M=6.4 earthquake near the city of Hualien, which is home to over 100,000 people. This picture shows a partially-collapsed building in the city of Hualien, on Taiwan’s eastern coast. The earthquake which caused this damage was a M=6.4 quake which struck just two days after a M=6.1 just 15 km to the southeast. 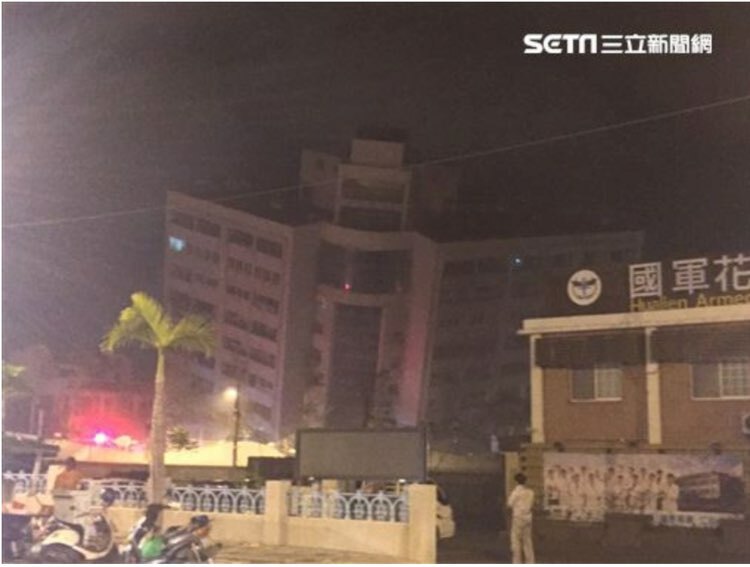 This picture from The Guardian shows a building which suffered at least a first story collapse in today’s M=6.4 earthquake north of Taiwan’s city of Hualien. Based on early reports and pictures, there is significant damage in Hualien, at least two people are confirmed to have been killed, and over 200 people were injured, 27 of them seriously according to the New York Times. Additionally, NPR announced that seven buildings had collapsed and while people remain trapped beneath the collapsed buildings, the National Fire Agency announced that they had rescued 149 people trapped in the rubble. 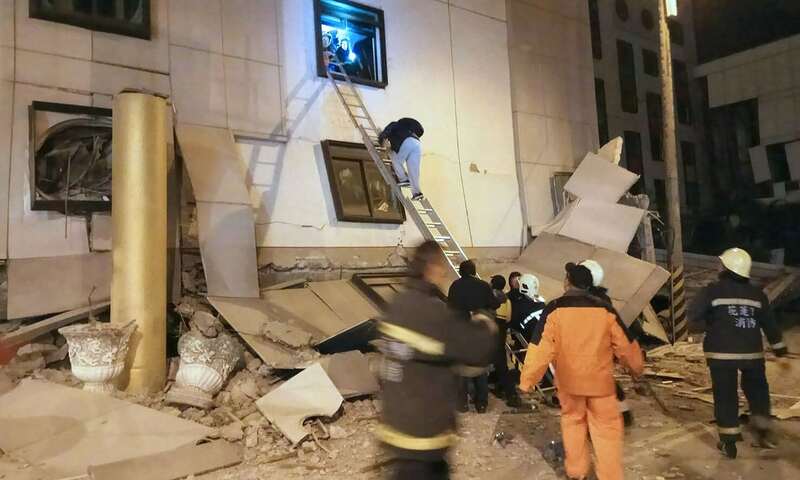 However, people remain trapped in a partially-collapsed hotel. The photos above show some of the major damage sustained in the earthquake. The reported damage is higher than forecast by the USGS PAGER system, which anticipated less than $1 million in damage. This is likely due to an underestimation of the amount of shaking around Hualien. The ShakeMap produced by Taiwan’s Central Weather Bureau can be seen below. 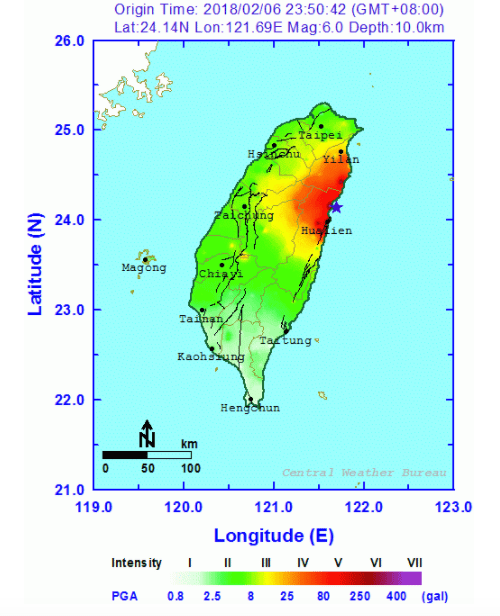 This figure shows the ShakeMap produced by Taiwan’s Central Weather Bureau. In the city of Hualien, shaking reached Intensity Level 7. This Temblor map shows the location of the recent earthquake on Taiwan’s eastern coast. Both of the recent M=6+ quakes occurred at the northern tip of the Longitudinal Valley Fault, Taiwan’s longest and most active fault. While the earthquake over the weekend was predominantly compressional in nature, today’s event was nearly pure strike-slip, according to both the USGS and GFZ-Potsdam. Because of this, today’s quake may have struck at the northern tip of the Longitudinal Valley Fault, which is known to have both compressional and left-lateral motion. As we said yesterday, 30% of all earthquakes in Taiwan occur on or near this fault. It also has the highest slip rate of all faults in Taiwan. 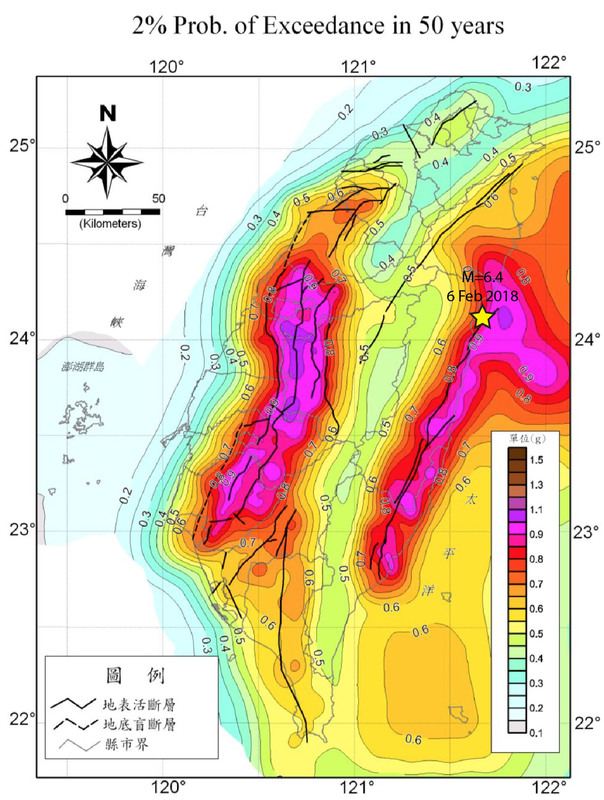 While the M=6.4 shock occurred offshore at the northern tip of the Longitudinal Valley Fault, several of its large aftershocks occurred 20 km (12 miles) to the south, beneath Hualien, also on or near the Longitudinal Valley Fault. So, there appears to be a seismic propagation of aftershocks along the Longitudinal Valley Fault. 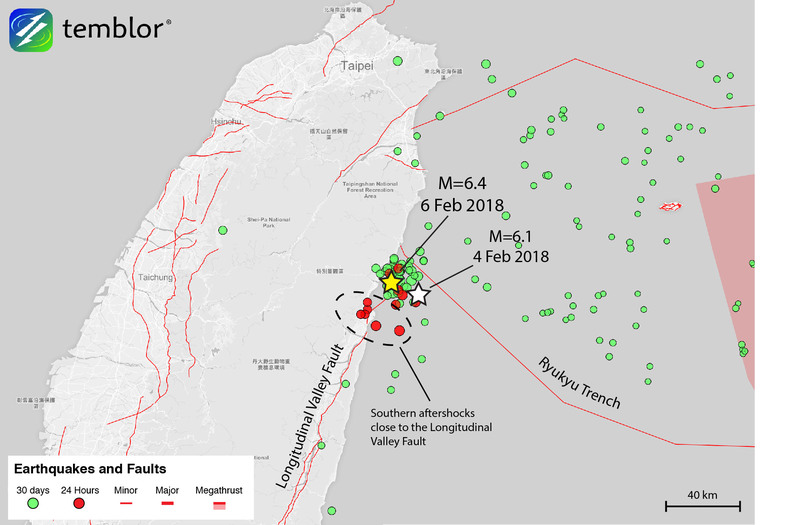 This raises concerns that these events themselves could be foreshocks to still larger earthquakes that could rupture south along Taiwan’s longest, and most active fault. Today’s shock should not come as a surprise. The Taiwan Earthquake Model, a university, government, and industry consortium that uses the tools and libraries of the Global Earthquake Model (GEM Foundation), is shown below. The area around the recent earthquakes has one of the highest hazards in the entire country. Therefore, residents of Eastern Taiwan should be prepared for potentially larger, more damaging earthquakes, perhaps propagating to the south. 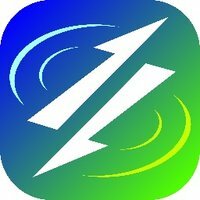 You can help many citizen scientists in detecting earthquakes and getting the data to emergency services people in affected area. Almost everything we love about areas like the San Francisco bay area, the California Southland, Salt Lake City against the Wasatch range, Seattle on Puget Sound, and Portland, is brought to us by the faults. The faults have sculpted the ridges and valleys, and down-dropped the bays, and lifted the mountains which draw us to these western U.S. cities. So, we enjoy the fruits of the faults every day. That means we must learn to live with their occasional spoils: large but infrequent earthquakes. Becoming quake resilient is a small price to pay for living in such a great part of the world, and it is achievable at modest cost. Half of the world’s population lives near active faults, but most of us are unaware of this. You can learn if you are at risk and protect your home, land, and family. Temblor enables everyone in the continental United States, and many parts of the world, to learn their seismic, landslide, tsunami, and flood hazard. We help you determine the best way to reduce the risk to your home with proactive solutions. In our iPhone and Android and web app, Temblor estimates the likelihood of seismic shaking and home damage. We show how the damage and its costs can be decreased by buying or renting a seismically safe home or retrofitting an older home. 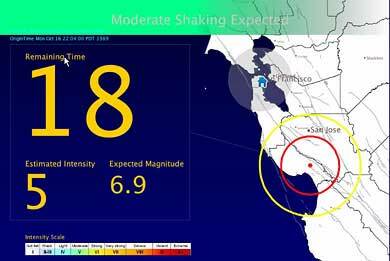 Please share Temblor with your friends and family to help them, and everyone, live well in earthquake country. Temblor is free and ad-free, and is a 2017 recipient of a highly competitive Small Business Innovation Research (‘SBIR’) grant from the U.S. National Science Foundation.